Buffet doesn’t require any introductions. 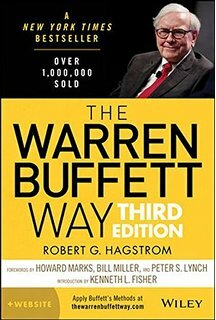 In this book, Hargstrom gives us an insight into Warren Buffet’s career as well as some of the people he worked with while developing his investment strategy. The book points out examples of successful investments by Buffet, which have contributed to his outstanding returns. Hagstrom not only covers how Buffet thinks about investing, he overlays examples of those ideas in action. It feels like Hagstrom had the retail investor in mind when he was writing this book. Seasoned investors might find the anecdotal aspects of the book the most interesting. In short, if you’re interested in learning more about how Warren Buffet thinks (and why), as well as what does ideas look like in practice then we highly recommend this book.